The essay “A Doctor Who Wish List” appeared in the 2011 book Shooty Dog Thing: 2th & Claw (page 239). This seven-page article outlined various characters and monsters that could profitably be featured in future seasons of the Doctor Who TV programme as well as various unresolved plotlines that could be the basis for various entertaining stories. 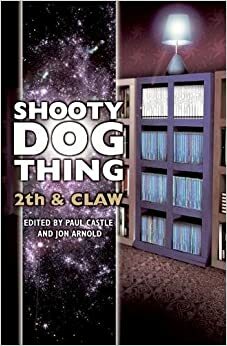 The book was a sequel to Paul Castle’s first Shooty Dog Thing book, which collected various articles and essays from the online fanzine of the same name. Unlike the first volume, the sequel featured all-new work from a variety of contributors. For technical/printing reasons, the illustrations that I provided for the original fanzine could not be reproduced with sufficient image quality in either volume. However, many of them can be viewed on this website. Every Doctor Who fan has something they’d love to see come true on screen, whether it be the return of a certain favourite character, the resolution of some long-standing mystery, or a sequel to a story they loved. Not to mention the things we’d like to see included in the books, or things we’d just like to see released at all. Some fans have a very short list of these wished-for items, and some fans (like me, for example) have accumulated a fairly long list. Many of these ‘wish list’ items are common to many fans, and some are unique to the (shall we say) more eccentric members of fandom. Or to put it another way, some of the wishes are reasonable, and some are pie-in-the-sky, not-a-chance-in-a-million-years-mate not at all reasonable – but that doesn’t stop us from secretly keeping the hope alive in some small, fervently fanboyish corner of our hearts. The main contributors to this book were Paul Castle and Jon Arnold. Amongst the other contributors were some famous names, including the writers Colin Brake and Simon Bucher-Jones. You can click here to buy the book on Amazon.